KEMBA Financial Credit Union merged two LOS systems to offer automated decisioning for indirect applications. A series of if/then rules helps the credit union make better decisions overall and automate decisions for half its indirect loans. At KEMBA Financial Credit Union ($1.2B, Gahanna, OH) necessity is the mother of invention. When the Ohio credit union’s one underwriter for indirect auto loan applications left in 2015, the organization’s leaders saw the opportunity for KEMBA to adopt a more robust automated decisioning strategy, says Mark Seymour, vice president of lending and risk. At that time, KEMBA’s lending department was running on two separate LOS systems: indirect on one, consumer on the other. The consumer system featured some automated decisioning ability, the indirect system did not . “It made no sense,” Seymour says. Borrowers today can go online for a quick loan decision and funding, so KEMBA started using its consumer LOS for indirect lending in the hope that automation would improve the member experience as well as control overhead expenses. Automated decisions are more prevalent on the indirect side, says Mark Seymour, vice president of lending and risk at KEMBA Financial Credit Union. That’s because most indirect applications come from non-members. The credit union likes to decision those applicants quickly and spend more time on member applications. Curious about how your indirect portfolio compares to peers? Let Callahan walk you through your numbers with a customer performance audit. Sign up now. According to Seymour, the upper left position on a nine-box grid represents borrowers who would receive an automatic ‘yes.’ They have high FICO scores and high ancillary ratios, meaning: low unsecured debt, and good debt-to-income and collateral ratios. 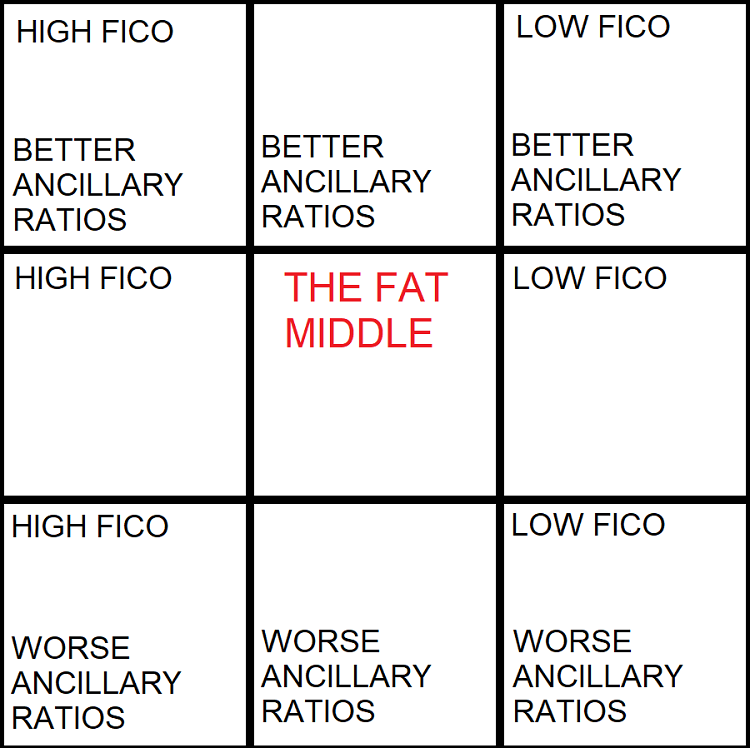 Borrowers who fall into the Fat Middle are harder to automatically underwrite because their finances do not signal a clear approval or denial. The bottom right position contains borrowers who would receive an automatic ‘no.’ They exhibit an inability to repay on time and require financial education before they qualify for credit. KEMBA is more than likely to decline these borrowers, especially if they are not a current member. The box in the very middle is inhabited by borrowers who might have had some credit challenges but do not have a charge-off. Applications here are not easy to automatically approve or deny and require a human underwriter for the final decision. This is the “fat middle,” and KEMBA has automated decisioning rules geared toward shrinking the number of people that fall into this category. At first, KEMBA based its automatic loan decisions solely on FICO score, independent of loan size. But when the credit union took a closer look at applicants, it noticed a pattern. So, the credit union added compensating factors to its automated decisioning logic. Now, it focuses on five criteria in addition to FICO scores: loan-to-value (LTV), debt-to-income (DTI), loan term, payment-to-income, and unsecured-debt-to-income (UDTI). Why Does KEMBA Use UDTI? KEMBA uses UDTI as a proxy to a bankruptcy score. It the ratio is high, the borrower presents more risk. With that criteria, the credit union has created a cascading set of 20-40 if/then rules by which to automatedly decision borrowers, McCoy says. The system can change each of the metrics and identify which mix of compensating factors creates the conditions for an approval without adding undue risk. For example, based on credit score, KEMBA has set guidelines for acceptible ancillary ratios. For an A borrower, the credit union might look for a DTI less than 45% and an LTV below 120%. But what happens when that borrower has a DTI of 46%? KEMBA has built in compensating factors into the decisioning engine's logic that will get the application to an approval. In this instance, the engine will require an LTV of 110% or lower. “We play with the criteria, tightening and loosening things to where it makes sense to us,” Seymour says. Additionally, KEMBA is less restrictive to current members. Seymour agrees that service and experience for existing members is paramount. They are rarely, if ever, denied by the automated engine. KEMBA will kick the application to a human underwriter before that happens. Are 4 Credit Tiers Better Than 5? However, borrowers who fall into the top 85% of credit tier four perform the same as borrowers in credit tier three, whereas borrowers in the bottom 15% of credit tier four perform the same as borrowers in credit tier five. So why have five tiers? The credit union is considering splitting tier four accordingly, looking to provide better value to its members. Although the credit union strives to reduce the number of applicants that fall into the fat middle, playing with these metrics can cause unforeseen affects. For example, the credit union created a rule for borrowers that were looking for an 84-month loan term while on a fixed income and with a high LTV. The three together proved to be a bad mix. “Every time you do something, it affects something else,” McCoy says. When rules don’t work as expected, KEMBA digs in for a deeper review to understand why. In fact, it’s always monitoring its decisioning. Each month, KEMBA takes a random sampling of its automated decisions to see how they’re performing. Seymour and McCoy want to know how the loan looked at the point of approval and how it evolved overtime. Despite the credit union’s best efforts to provide a fast decision that benefits both the borrow and the institution, there are times when a profile precludes an automated decision. In those cases, the application goes to a human underwriter for a final decision. Today, KEMBA automatedly decisions 50% of its indirect loan applications — representing both approvals and denials — and will likely increase that in the future as it continues to reduce borrowers in the fat middle.